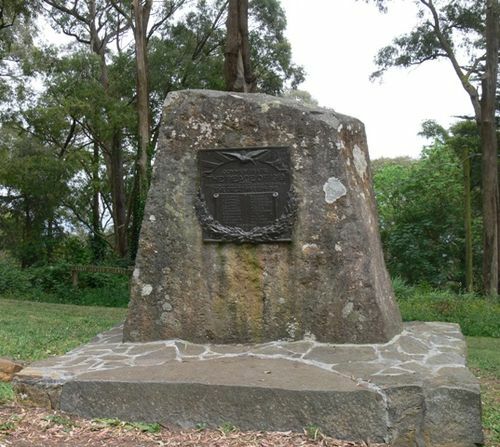 The Memorial commemorates the peace of 1919 and lists the men of Mount Dandenong who served in the Great War 1914-1918. The tablet for the Peace Memorial to be erected on Mount Dandenong has just been executed by the well known Melbourne sculptor and is, says "Table Talk" one of the most beautiful pieces of bronze work yet produced in Melbourne. A dove in high relief, bearing an olive branch in its beak, symbolises the Dawn of Peace, and the Rising Sun appears above the names of all those who left Dandenong to fight in the great war. The whole tablet is supported by a richly graven laurel wreath. This tablet is to be erected on a granite monolithic boulder, on a prominent spot near both the new and old roads. This boulder was one of several unearthed during the works on the new road and its removal to the spot of erection will be a matter of interest. The tender of Mr. Bladen for removing and erecting the rock and tablet was accepted at the last meeting of the Peace Memorial Committee. Healesville and Yarra Glen Guardian (Vic), 18 September 1920. A monument commemorating the Peace of 1919 and recording the names of those men of Mount Dandenong who served their country in the great war, was unveiled on Anzac Day, in the presence of a large assemblage by Chaplain Colonel Dexter,D.S.O. The monument occupies a commanding position in Jeeve's Gap overlooking both the new and the old roads. Argus (Melbourne), 29 April 1921.